In the not too distant past, software was reserved for the national brands whose reach stretched as far as their wallets. Big-box retail stores would hire their own team of developers to create proprietary software to manage inventory, something that smaller, mom-and-pop retail stores couldn’t even imagine affording. This technology not only made doing basic functions regarding inventory easier, like ordering another shipment, but it also automatically documented everything. Today, things are a big different. Although brick-and-mortar retail stores are on the decline, there are still some parts of the country (and world!) where big-box stores are harder to find than small ones. While creating software on a computer might still be costly for these shops, creating a mobile app isn’t. For smaller retail stores, mobile apps work because the hardware is already in their employee’s pockets. With Snappii, you can create a mobile app that fits your shops needs with zero coding experience! Using Snappii’s online app builder, putting mobile apps together is as easy as dragging and dropping the functions you need into a list. Try it out and see how easy it is! Some companies have started coming up with generic retail inventory managers that function as a bare-bones tool. Snappii, however, allows you to customize exactly what you would like to see out of your mobile app, enabling you to make the perfect solution for your business. When using a mobile app, everything is archived. As soon as the app turns on, it is automatically saving every action. In a retail environment where customer’s can approach you at any moment, this means you’ll never lose data that you’ve already inputted. This data can later be used to identify choke-points in your workflow. 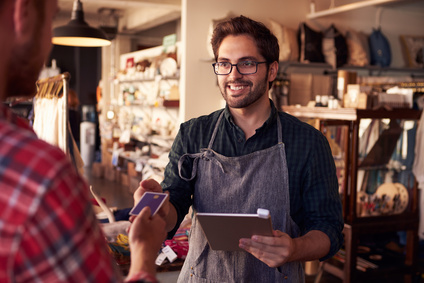 This can become invaluable for stores that have trouble keeping up with their inventory manifest, or if forgetting to order products has become the usual for employees. Mobile apps can help with restocking as well. Once the mobile app is setup to work with your business, you can re-order product right from the app. The advantage of this is that you can do this anywhere you have internet connection. Even if you do it in an area where you don’t, the mobile app will be smart enough to send your order when you do regain connection. That alone can save your business time every month! Having employees do inventory can be nerve wrecking, especially for smaller shops where everything has to be accounted for. Using mobile apps, it’s easy to setup multiple users that have access to different parts of the same program. This allows you to setup user settings in such a way that your employees are able to view the catalog and check if the number of products lines up with the numbers in inventory. You can extend this feature as far as you want. Depending on how many different positions there are in your business, you can create as many different configurations for what the end-user sees as you need. Everything will be synced to the same cloud, so any information recorded through the mobile app will always end up in the app creator’s hands. Building your first mobile app for your business may be daunting, which is why Snappii created templates. Templates are pre-made apps that already contain the features relevant to your business. This makes preparing the app significantly easier because the user just has to change the information to represent their business – the structure is already there. Retail stores have been making software to manage their inventory for decades. These programs usually require expensive hardware and even more expensive programmers to keep them updated. Snappii puts the power in your hands by enabling YOU to build YOUR own mobile app. Try out our editor today and see why even mom-and-pop shops can compete with the big leagues. This entry was posted in Blog and tagged mobileapps, mobileforms by Steven Rovito. Bookmark the permalink.